Hi everybody! Me featured with an article again in Pet's Mews again. This time it all about Earth Hour. You will join us too for Earth Hour again right? To reach as many people and plushies you can read the article here too. Hi everybody! Me back here in Pet’s Mews with some important news. March 25th 2017 it will be Earth Hour again. Me always celebrate Earth Hour with me friends. 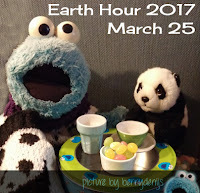 Last year me did the #cookiereportearthhour where me asked if you all wanted to help me by posting a picture of you during your Earth Hour. It was a great success (you can read all about it on me blog if you simply click here). This year me hope you all will join in again. But first me will tell you more about Earth Hour. Earth Hour was invented by the World Wildlife Foundation in Australia. The first event was in Sydney in 2007. It was such a success other countries started to participate too. And now we have more than 7000 cities worldwide who participate in every year! In short Earth Hour is one hour per year that we turn off all the lights, power down as much appliances as possible and take a moment in the dark to show we love Momma Earth and will try to help her get healthy again. If you do not want to sit in the dark you are allowed to light some candles or flashlights. Or maybe make a bonfire and have a party! During Earth Hour there are loads of stuff you can do. Like hikes in the dark or make a light painting outside. You can read more about Earth Hour on the special website: EarthHour.org. The best part of Earth Hour is that it is held in your timezone! That means that the darkness will be rippling around the earth, starting in New Zealand and ending all the way in Hawaii. Me once saw a clip recorded in space where you can see the switching off and on of lights waving over the planet. It was quite impressive. Last year me asked you all to help in your local Earth Hour timezone by showing the world we care about Momma Earth. Me had so many friends helping out. Can we go even bigger this year? Please post a picture on Instagram during your Earth Hour of how you are celebrating this hour. If you can post a candle or an alternative light source – like a flashlight – to show the world we care. Please tag me @cookiemreport and use the hashtag #cookiereportearthhour2017 so me can see all your pictures. Me really want to feature them in a blog again (like last year).